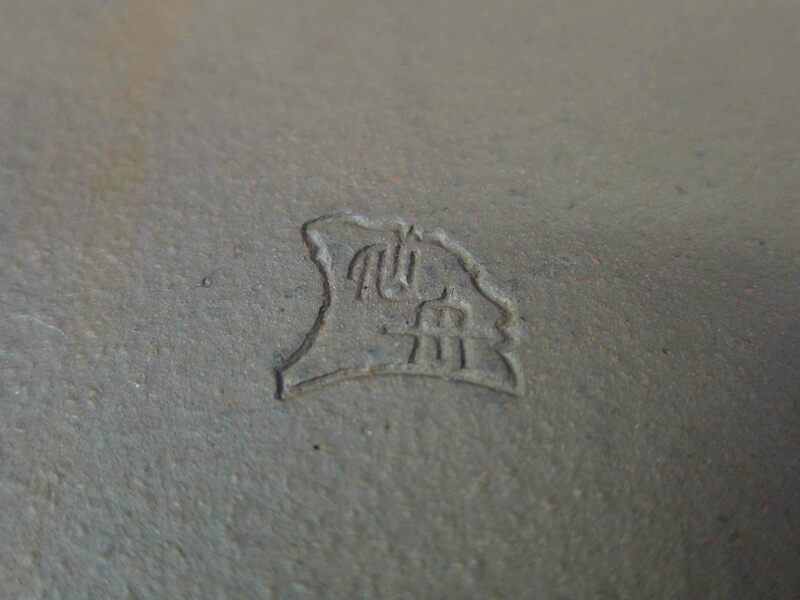 A ceramics plate showing all of Syu-zan’s chop marks. For those of you that don’t know, I’ve been actively learning and collecting more and more Bonsai ceramics. In Japan, most of the pottery that I come across tend to either be Chinese or Japanese. In this post I’m going to talk about one of my favorite Japanese maker and show some examples of his work. 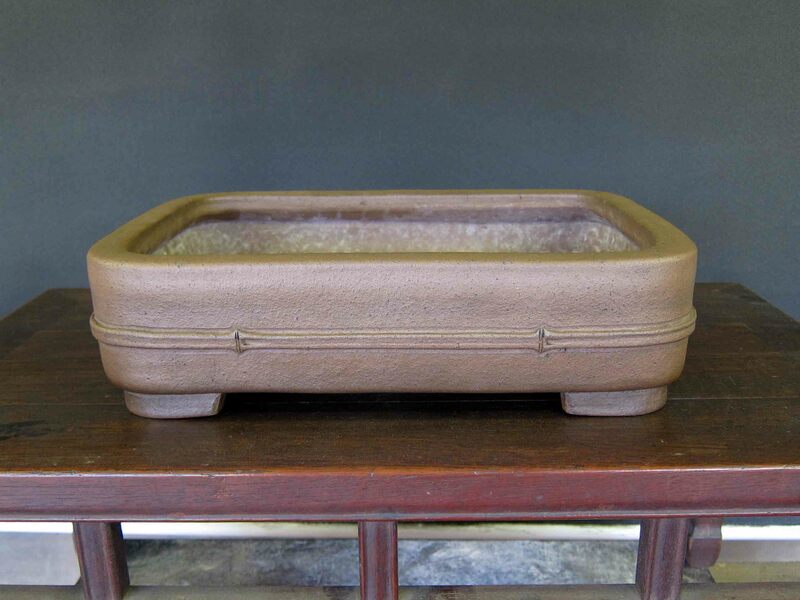 Syu-zan was born in Mie Prefecture in Tsu-city and grew up to become a Banker till 1971 when he decided to quit his job and become a full-time ceramics maker. Syu-zan produced pots for 17 years in Aichi Prefecture, Togo ward, east of Nagoya city (Aichien is in Nagoya) till his death in 1988. Syu-zan’s ceramics are well-known in Bonsai circles in Japan because of his Chinese Antique inspired works. 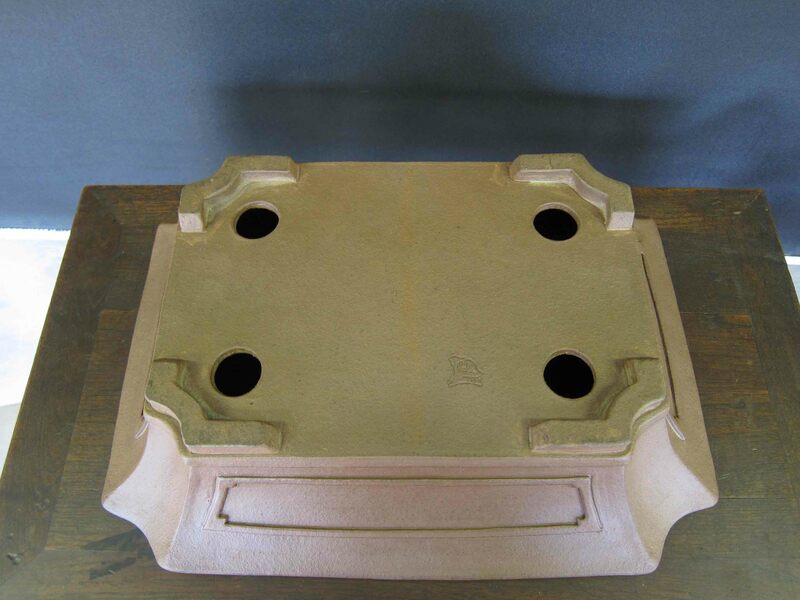 He is also one of the few Japanese pot makers that are considered to have produced high enough quality Bonsai ceramics that they are often used in Kokufu-ten. Syu-zan liked how the 18th and 19th century Chinese pots looked and wanted to reproduce them with his own personal touch. He even went to the extent of importing clay from China and mixing it with Japanese clay. 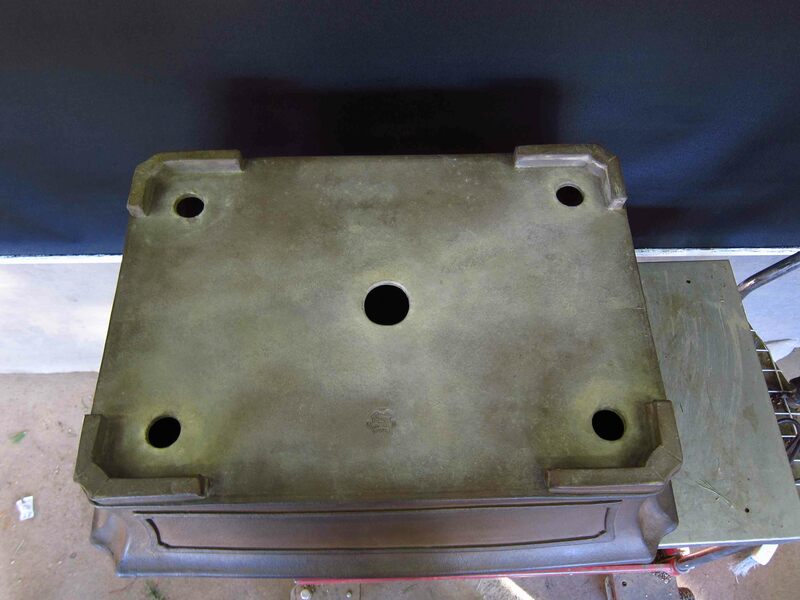 His modifications of the Chinese designs included increased depth and a refined/rough textured style that works well with bonsai. All of his ceramics are made by hand. I had conversation with Mr. Tanaka about Syu-zan and he says that he especially likes his works because they showed that the maker loved bonsai. 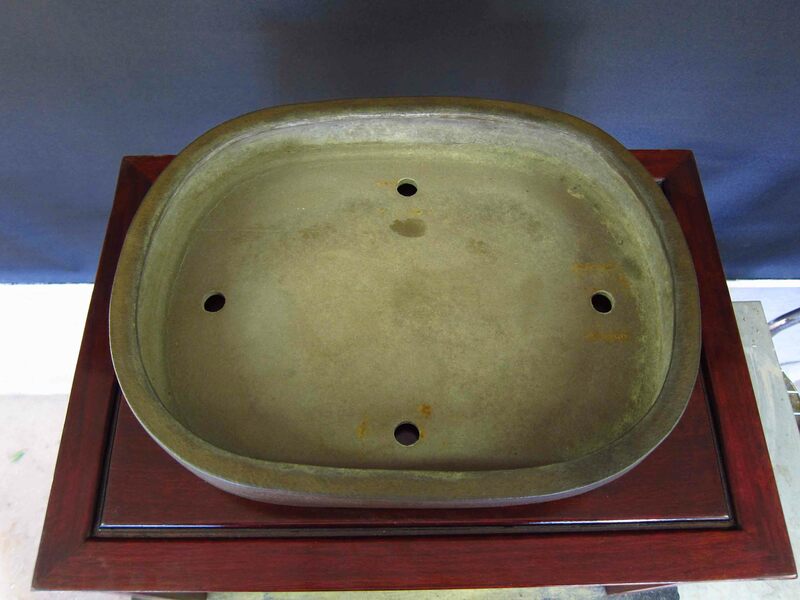 Mr. Tanaka’s belief is that a bonsai pot maker that loves bonsai tend to produce pots that work best with bonsai. So enough talk, lets check out some of Syu-zan’s works! 1. 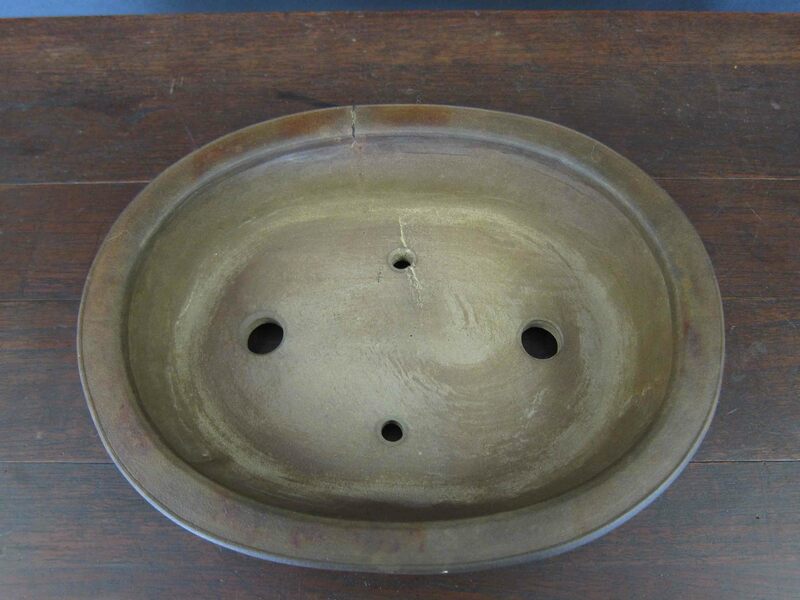 Here’s a small oval pot. 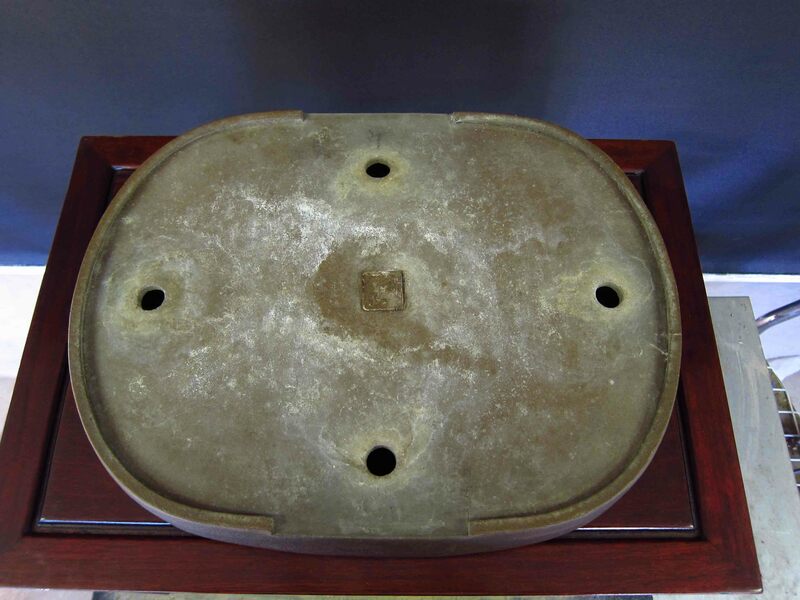 The clay is reminiscent of 19th century chinese with the simple design of 17th-18th century chinese bonsai ceramics. Such a simple pot with so many uses. Multiple types of tress in multiple styles will work in this pot. 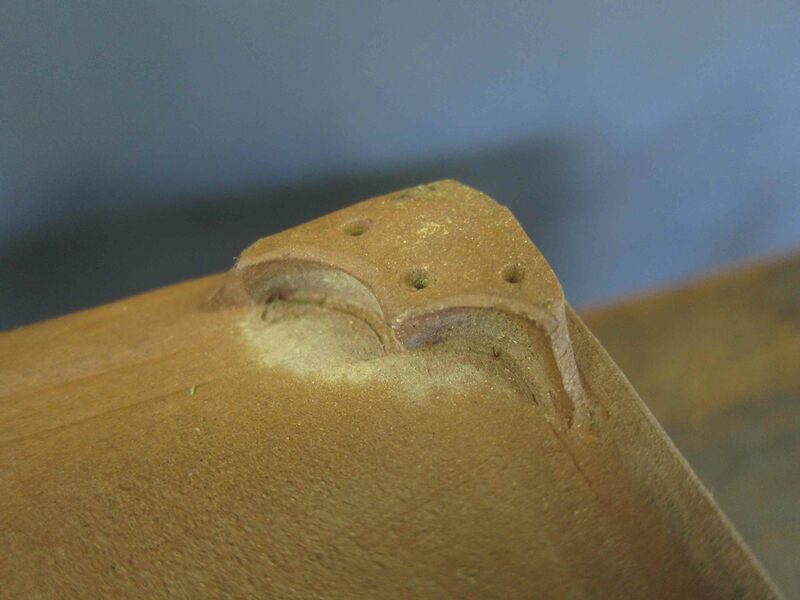 This curved build up of clay on the feet is a copy of 17th-18th century Chinese bonsai ceramics. 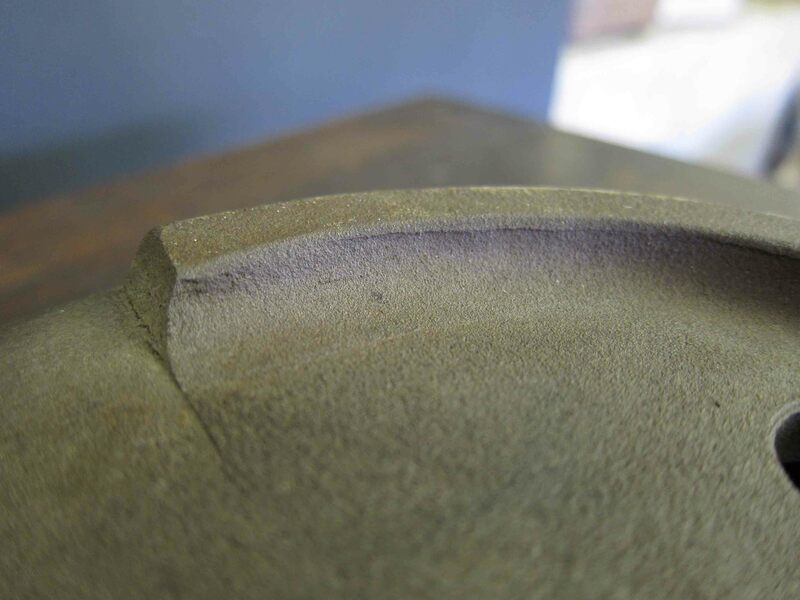 Here is a crack that formed during the firing process. 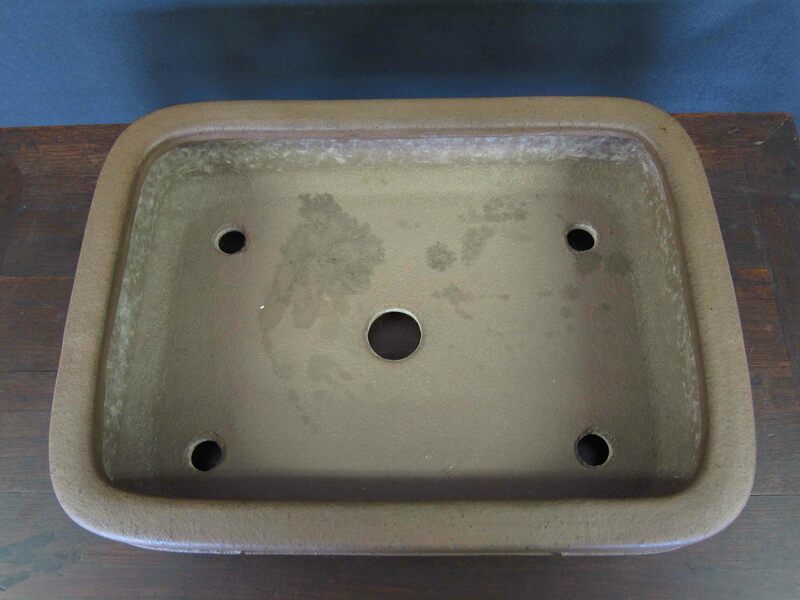 Instead of destroying the pot, it was repaired at the kiln and put to use. 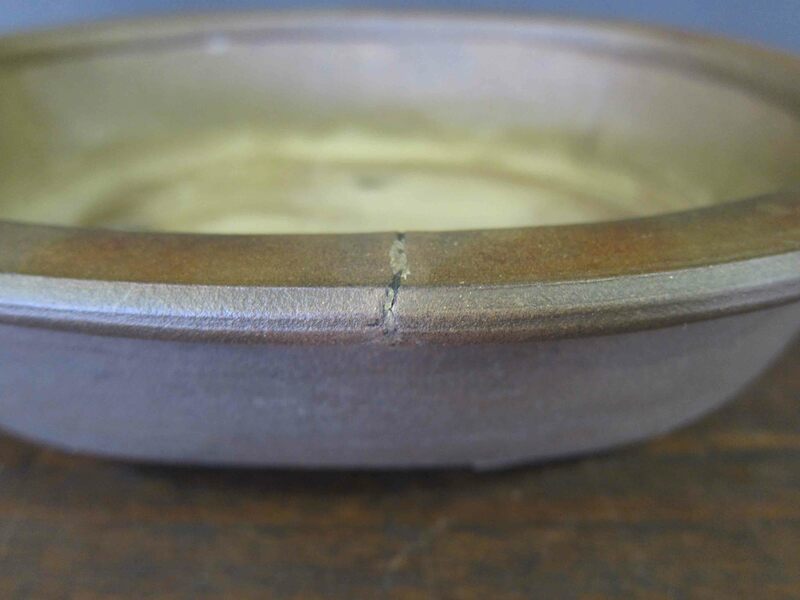 These kinds of cracks and repairs are considered just as strong as any other area on the pot, though the value of the pot does decrease. 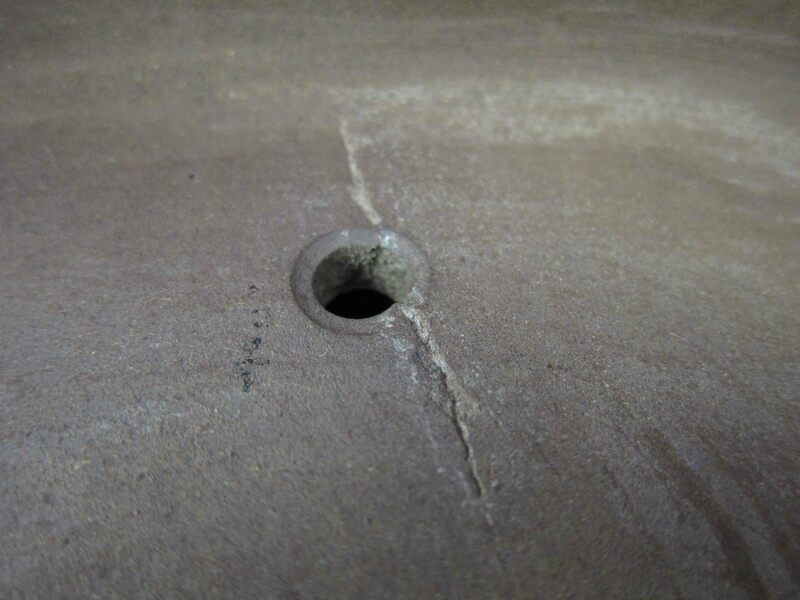 Here is another example of a crack that formed during the firing process. This crack too was fixed. One of the many Syu-zan chops. 2. 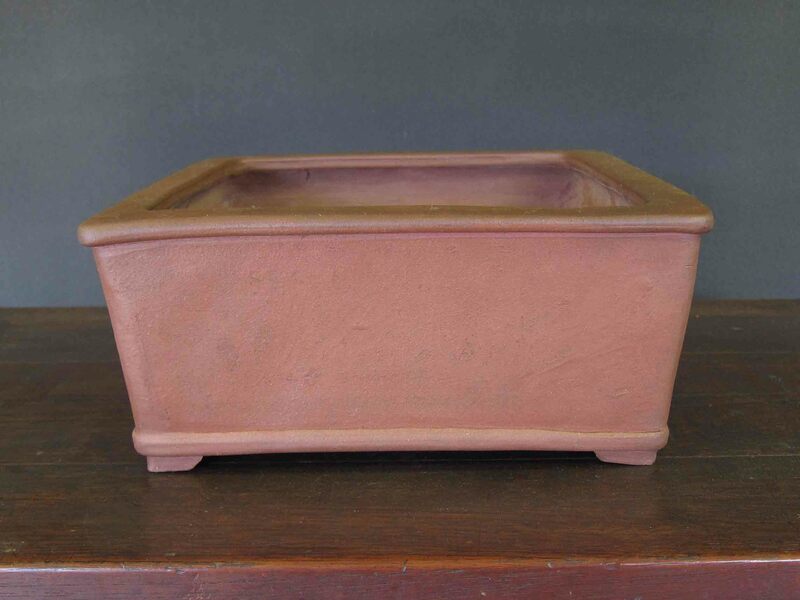 Here is an example of a deep square pot in a reddish clay. I can see a powerful semi-cascade pine or a tall twisty Juniper in this pot. 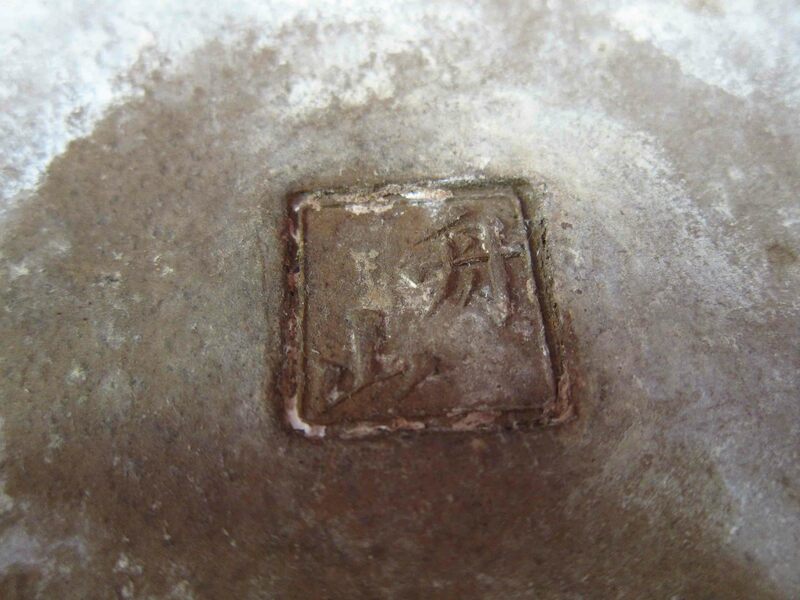 What can you see in this pot? A view from the bottom. 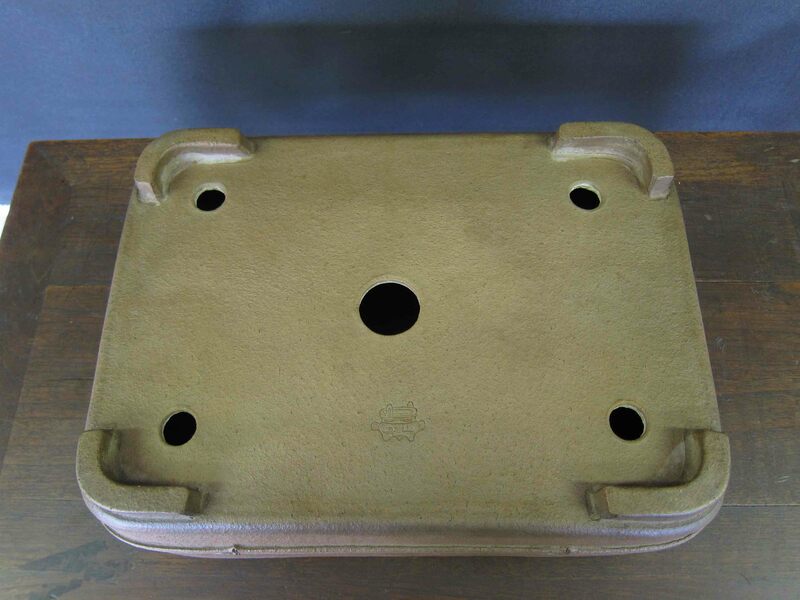 Note another firing crack on the bottom right drain hole. 3. 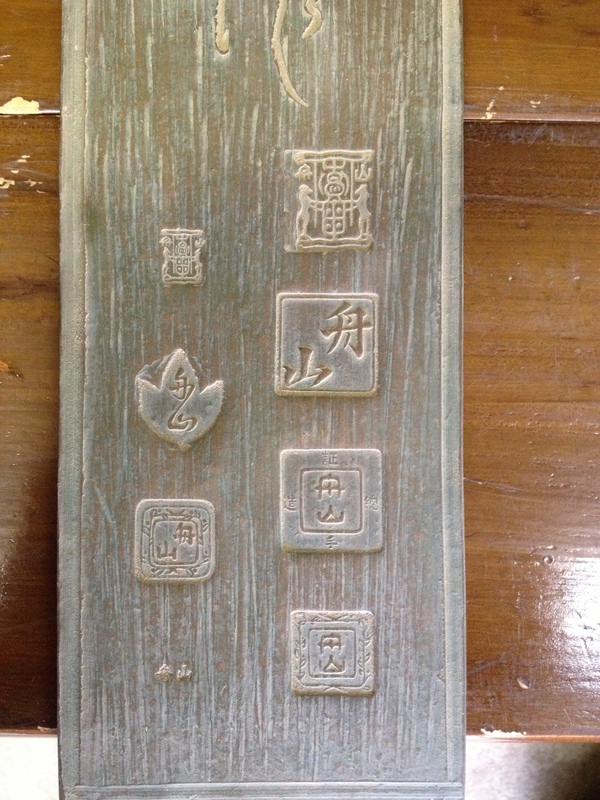 Here is one of my favorite clay types that Syu-zan uses. I like everything about this pot! 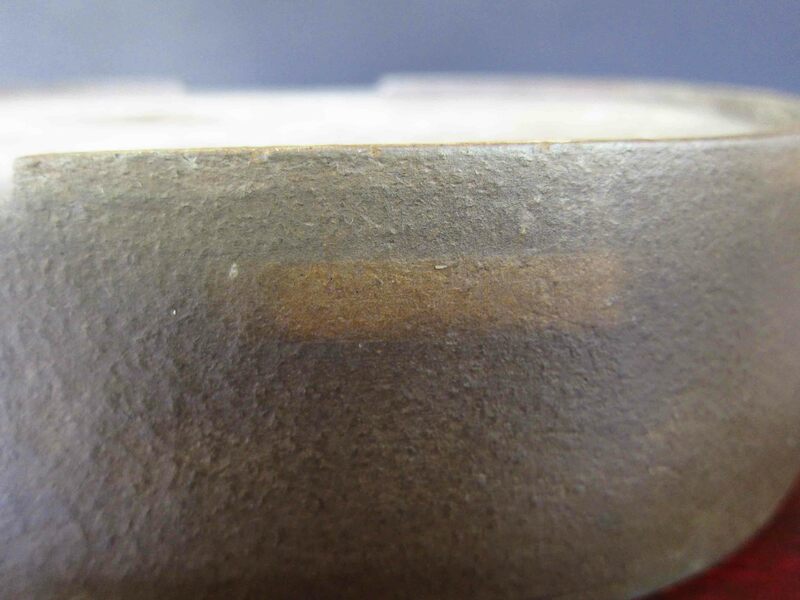 The texture is rough but yet refined The bamboo inspired band has interest and weight to the pot. 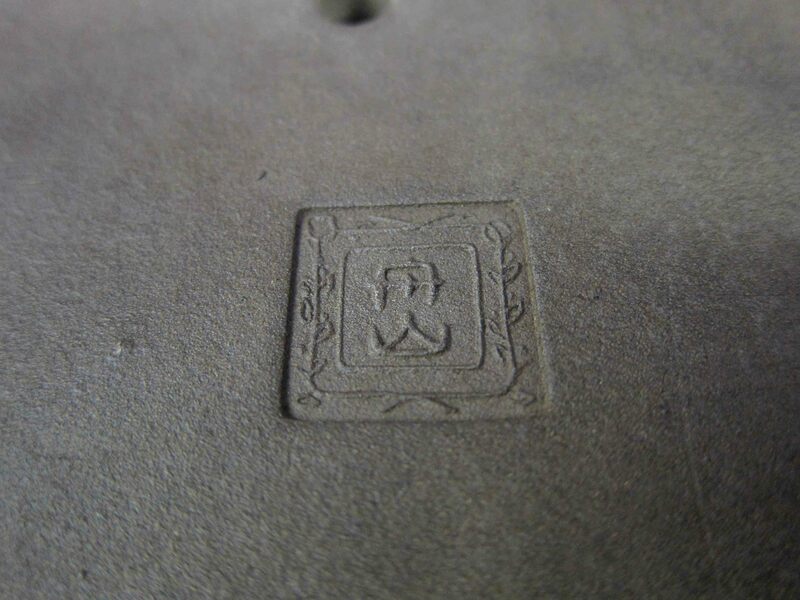 What I love the most are the thick blocky feet which reminds me of 17th – 18th century Chinese antique bonsai ceramics. 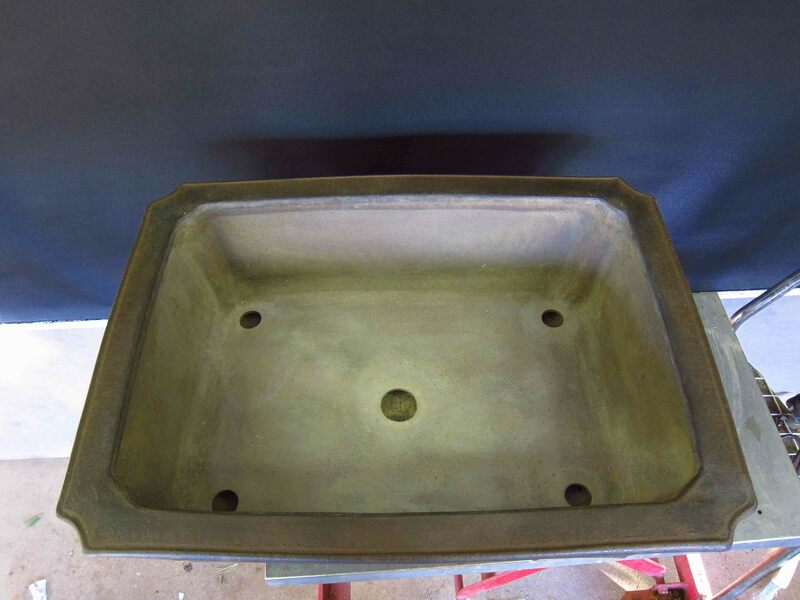 I look forward to using this pot in the future and building up the patina. What do you suppose would go into this pot? 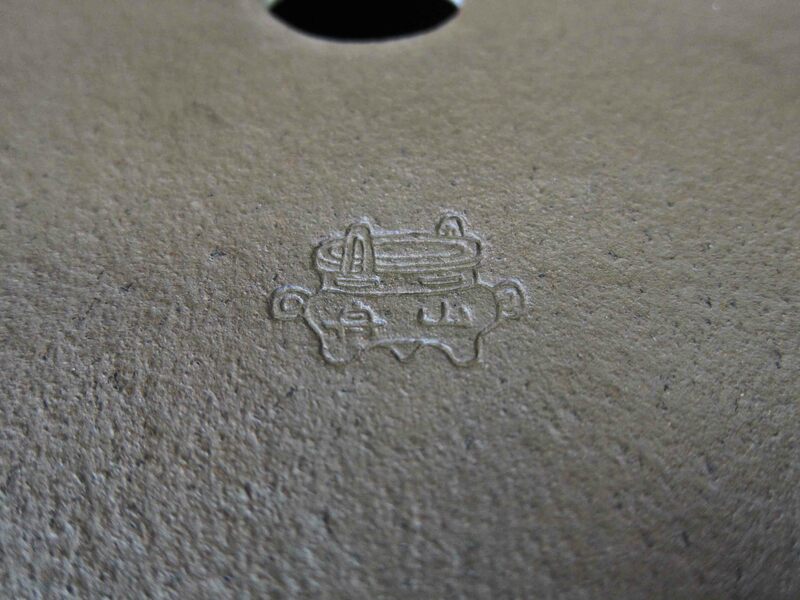 Here’s a close up of the texture of the clay. 4. Another example of Syu-zan’s more simple designs but the feelings it conveys are immense. 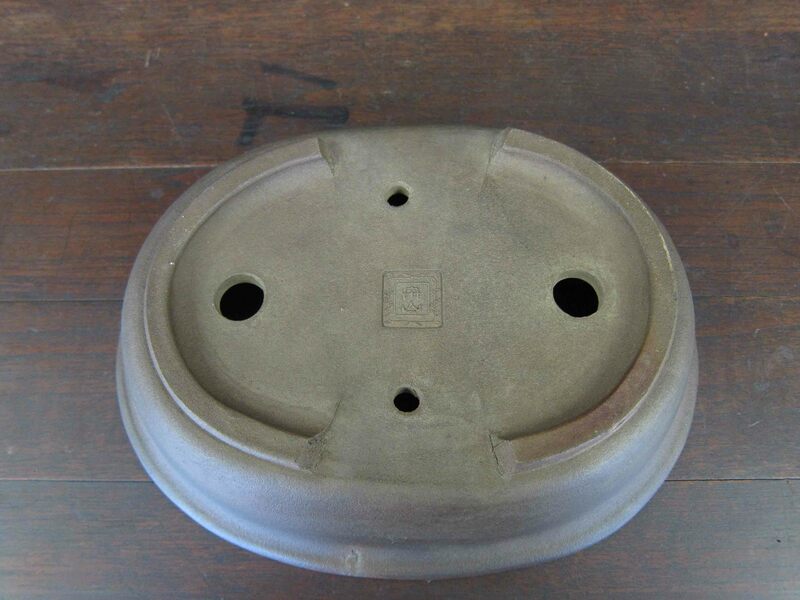 The seeking of perfection in a simple oval pot is something that should be examined and admired. 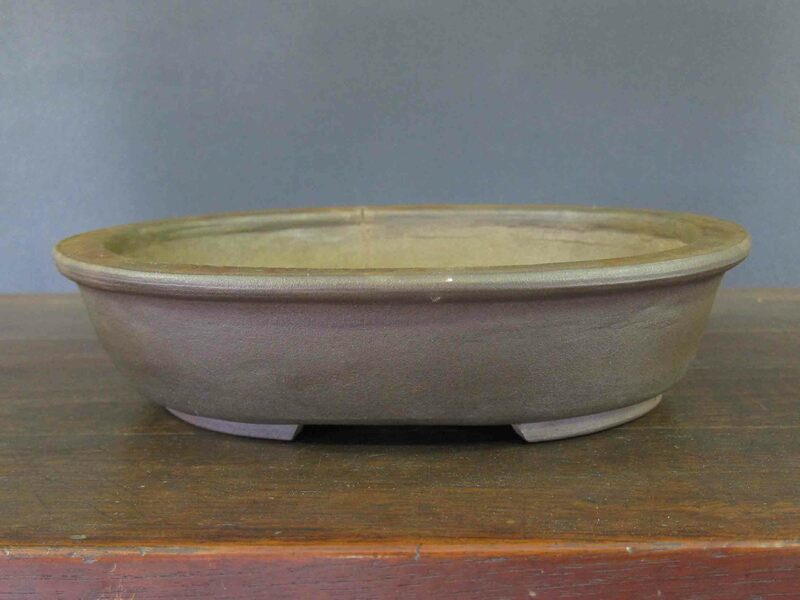 When I look at this pot, I can see that Syu-zan was going for perfection but inevitably lost to his own human imperfections. The same chop that pot #2 has. I looked at this discoloration for a good amount of time thinking about what might have caused it. 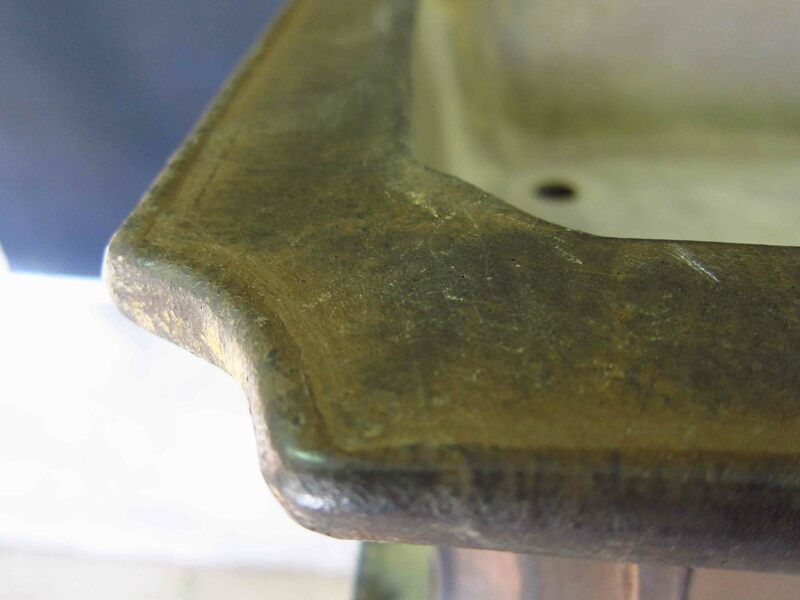 The light brown color is actually what the original color of the pot looked like and that the darker brown surrounding it is patina that has developed over decades of use. The light brown strip may have been preserved by a sticky label or rubbed with an abrasive object. 5. Here is an example of Syu-zan’s more complex works. Imagine the skills that it took to make this piece by hand! 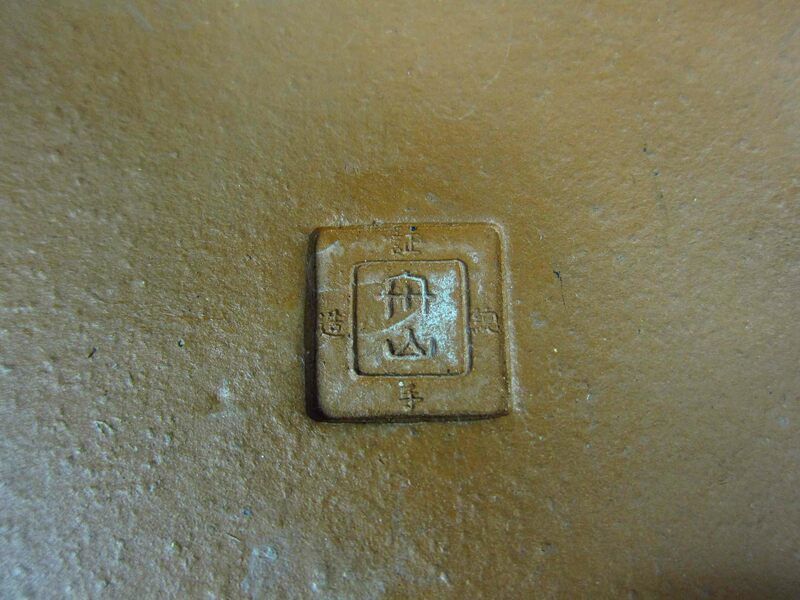 The clay of this pot is similar to the clay of pot #3 and they both have the same stamp. 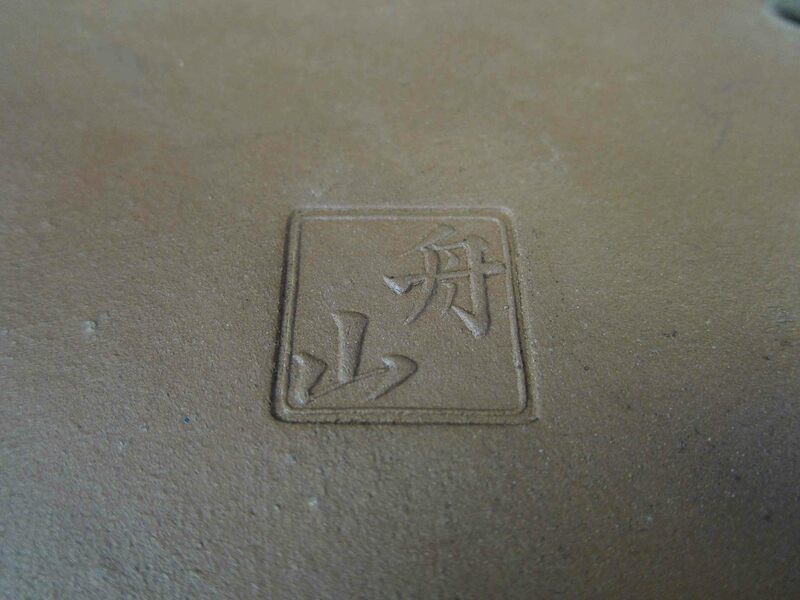 Perhaps Syu-zan used a certain stamp when working with different clays? 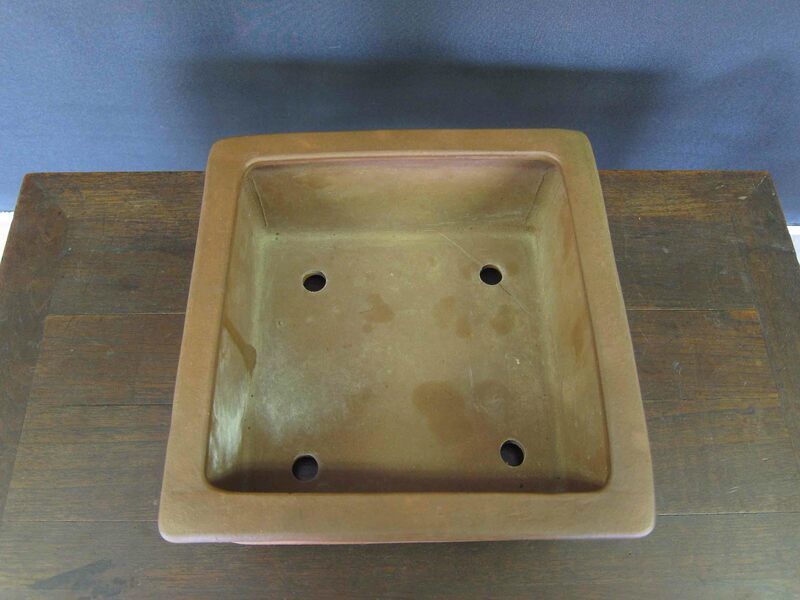 Another heavily used pot producing lots of patina. 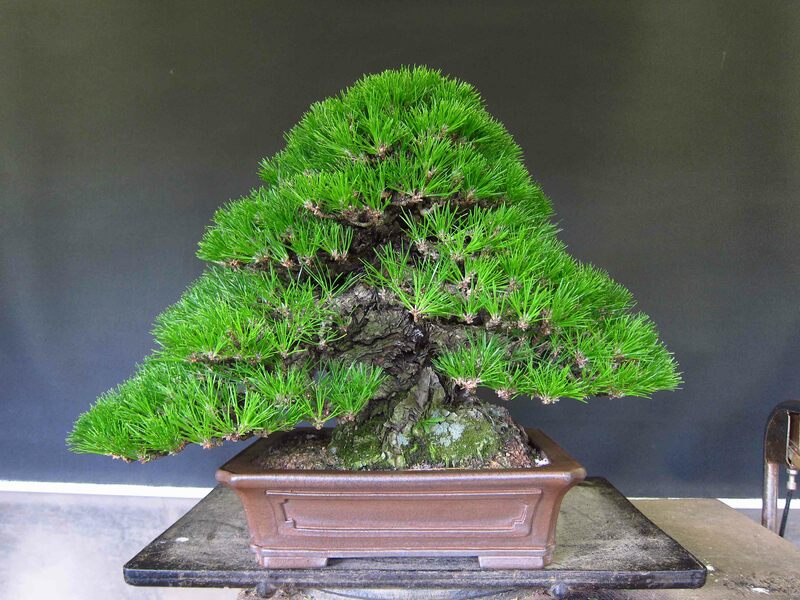 Here is an example of a powerful Black Pine in a Syu-zan pot that is similar to pot # 5. That’s a Kokufu ready combination there! #6 Syu-zan also made taiko drum pots as well. 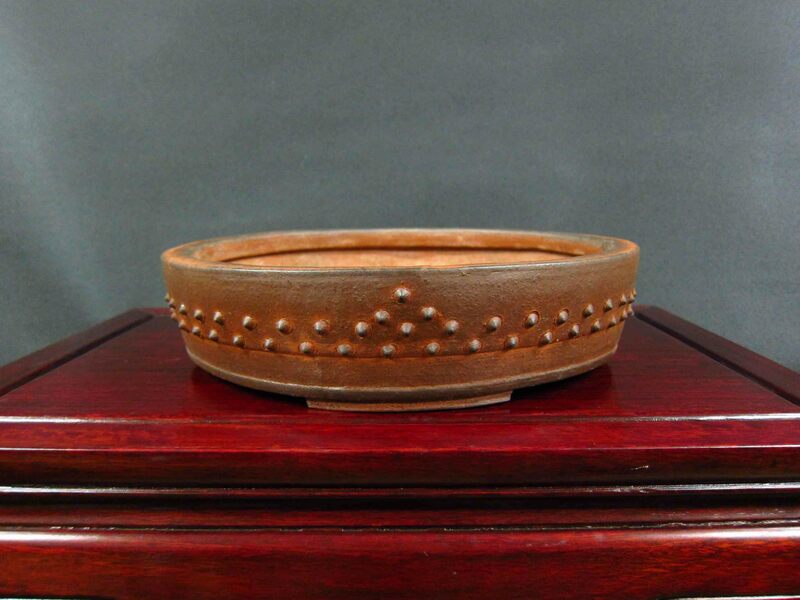 This particular piece is in a red clay that I just love! This piece has the same chop as pot #1. I guess the clay color matching the chop is out the window! What’s more likely is that a new chop was made as Syu-zan fine tuned his styles through the years. Syu-zan may have passed away but his legacy lives on in his surviving works and his apprentice Sen-syu. The following is an example of his works. Sen-syu’s works are heavily influenced by Syu-zan but does have its own unique style. I hope you all enjoyed looking at some of Syu-zan’s beautiful works of art! 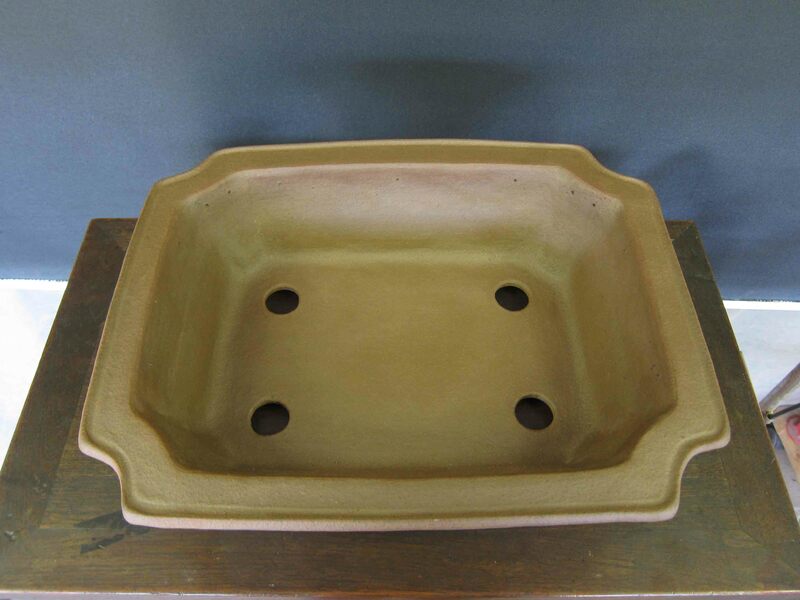 He created much more varieties of bonsai pots so it doesn’t end here. Hopefully in the future when I amass more photos of his works, I’ll write a second post to share them with you all! Thanks for reading and please feel free to comment below. 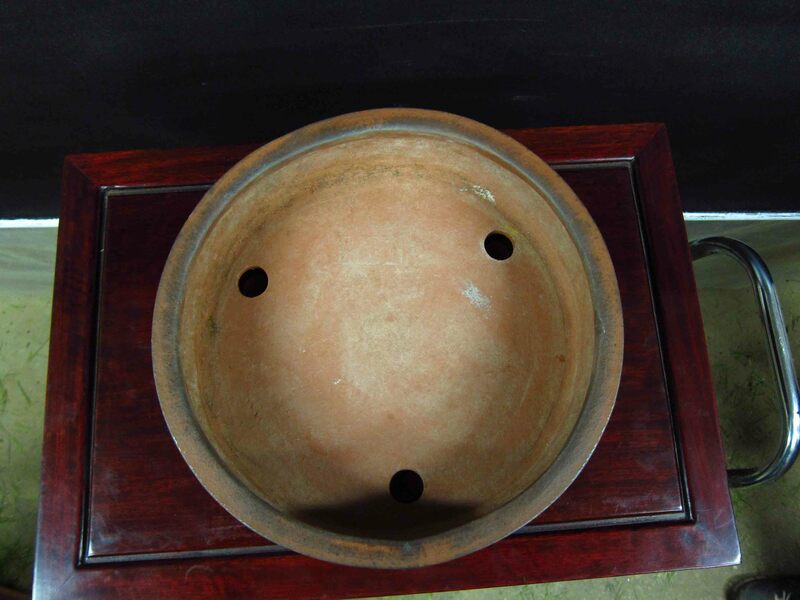 One Pot to Rule Them All #2 – In this post I examine multiple large lip Maruhei pots. 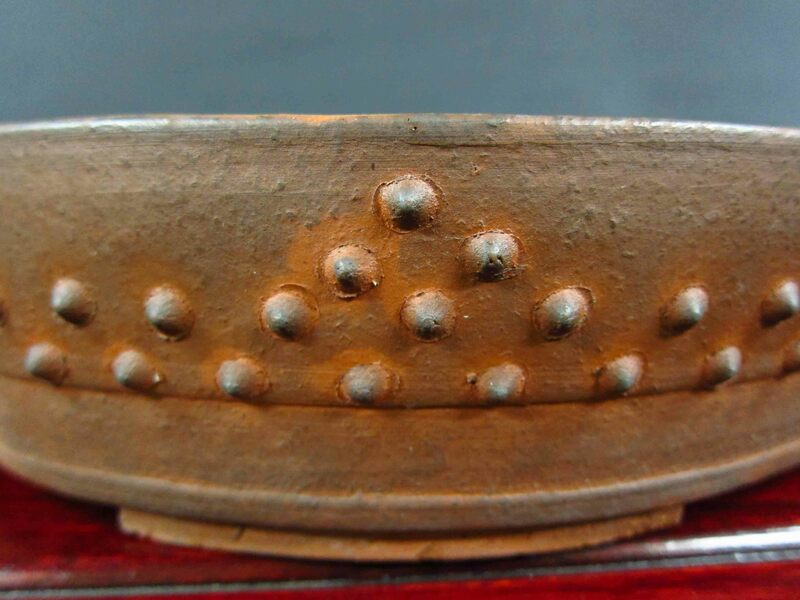 Kit-tachi Oh-sumi-kiri Kaku-men Chou-hou (A Type of 8 Sided Pot) – It says it all in the title! Lots of pictures and examples. 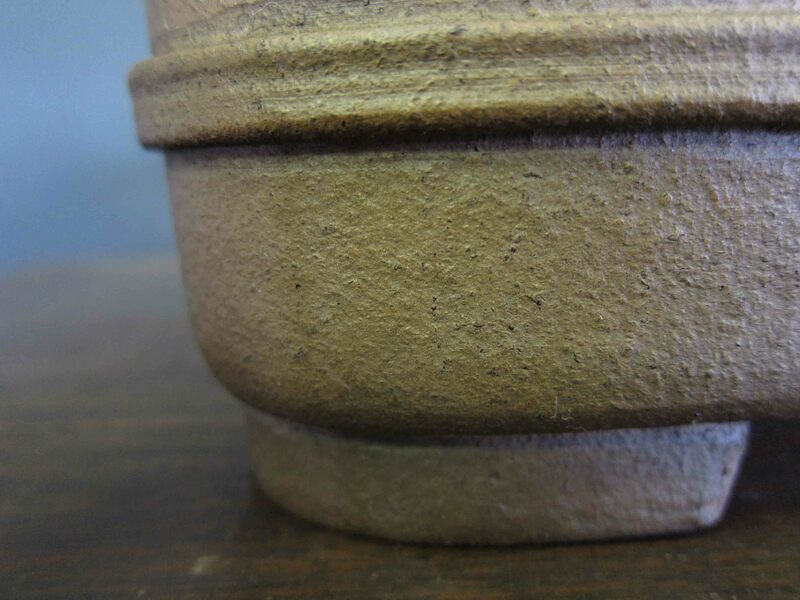 Namako Ceramic Pottery – In this post I talked about a certain type of glazed used in pottery. One Pot To Rule Them All – In this post I talk about a Bonsai pot that has the biggest lips I’ve ever seen! Concrete Pot Mystery??? 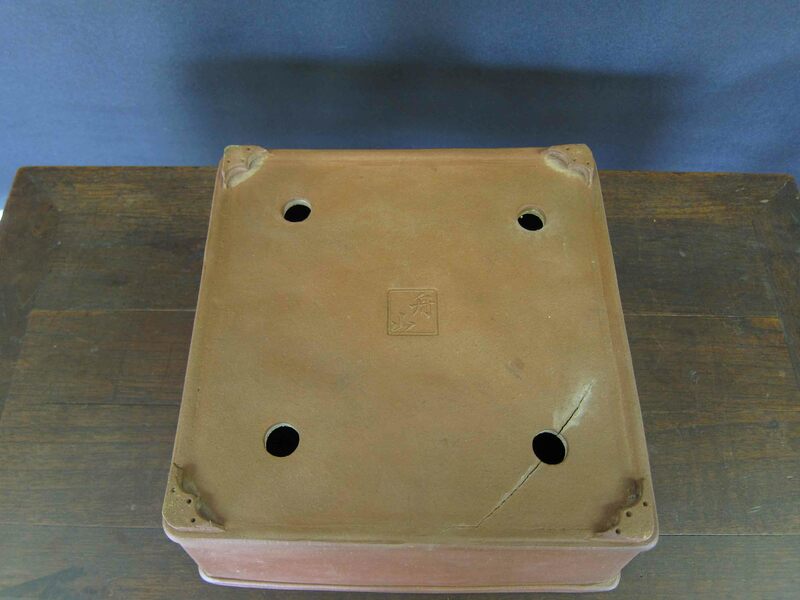 – In this post I look for clues for the origins of a concrete Bonsai pot. 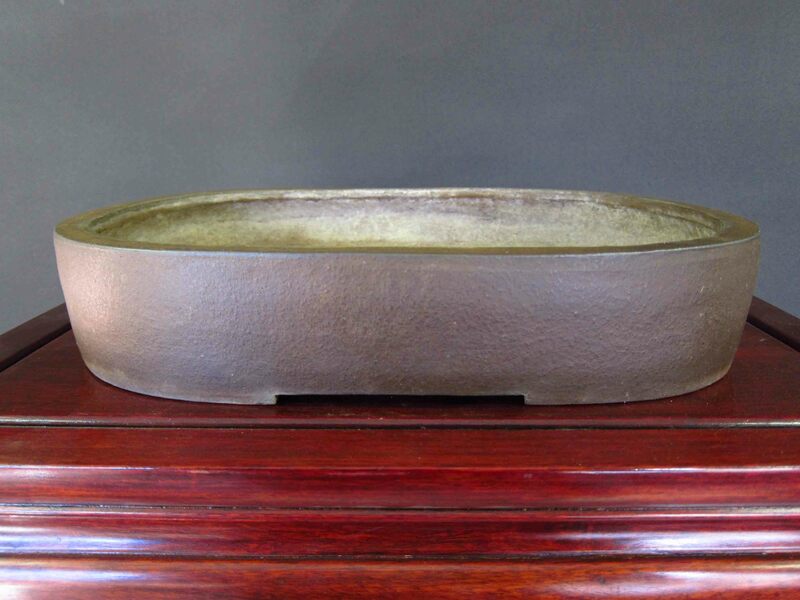 A Chinese Pot – In this post I talk about a glazed green Canton pot with and extra touch of special. What A Crack Pot! 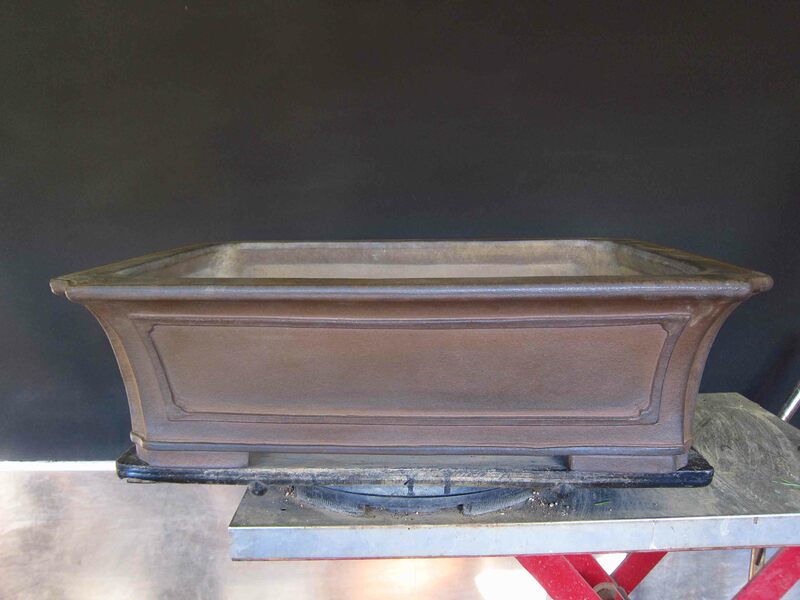 – In this post I talk about how I do some basic pot repairs. Pots and Patina – In this post I talk about patina on Bonsai pots and some great examples around the nursery. P.S. If you are actively reading this blog, I would appreciate it if you subscribe to it (right column of the blog). This is one of the best ways for me to know how many people are reading. Thanks! Thank you for sharing! I really enjoy his work. I love all the pictures. Thanks for reading and the comment! #3 is my favorite too though I do fancy #5 as well. 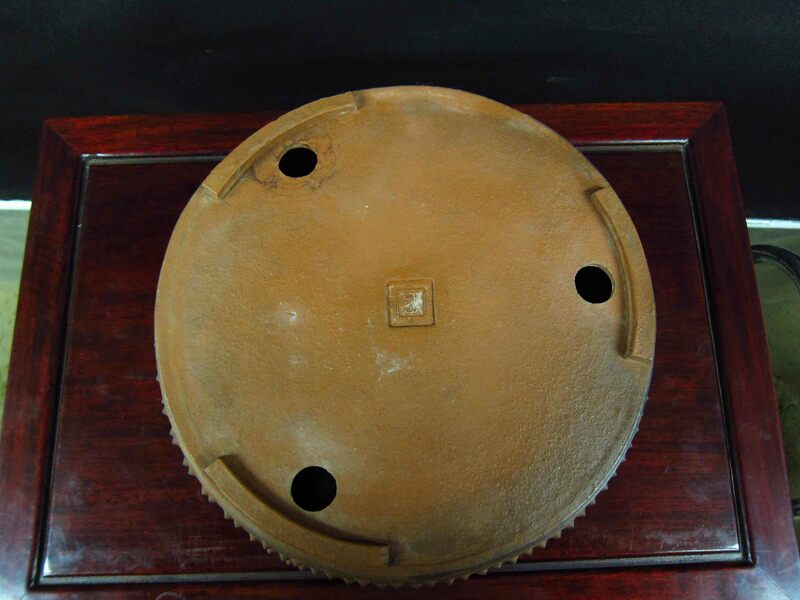 Pot number 3 is for sale and is priced at 85,000yen. Please convert to your currency. If you’re interested, please email me at: Peter@Peterteabonsai.com. You finally got the ceramic plate?? 🙂 Nice article btw!! No, I didn’t get the plate, though I’d love to have it. All I have is the picture. Doh! Interesting post I’m curious as to what the prices of his pots are? 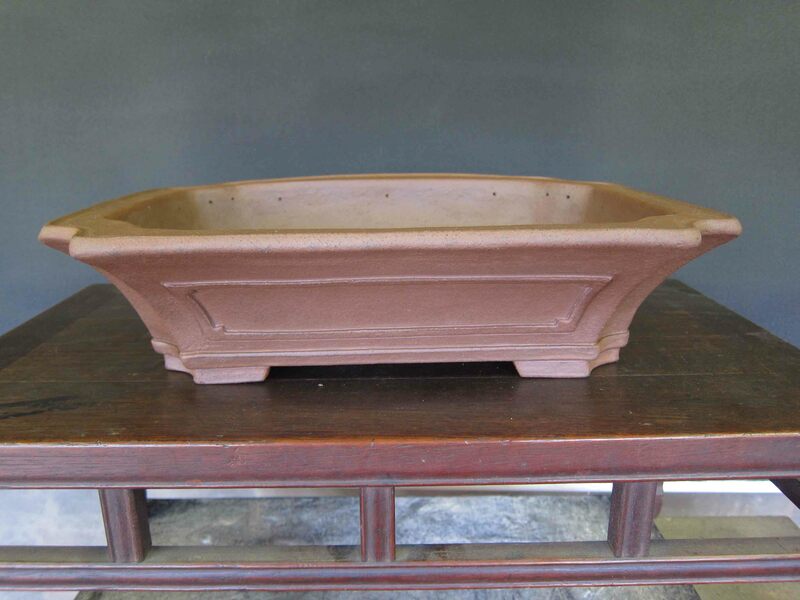 Not the cheapest bonsai pots in the world but some of the best. Concerning Shuzan and his different chops, or rakkan, which the Japanese pronounce as lakkan. I was told by my sensei shuzan used different rakkans as his pottery career evolved. Once he became famous, he began using the tea pot rakkan. As a result the later pots were more expensive. Many Japanese, including my sensei, place more value on pots with the older rakkans as these pots are older and fewer were made. I believe you are correct there Michael! I do like the newer ones with the teapot but the older ones are rarer for sure. That’s why I like pot number 4. Always interesting and informative! By the way, did you get a chance to go to Kokufu Ten this year? How did that tree you worked do? It will be interesting to see the real story behind the chops true meaning? I would love to see three photos of your personal favorite pots at your nursery, with or without trees! I really loved this post by Peter Tea so much I have to share it. Peter really has a knack for spotting great pots, it’s really amazing that your little tree could potentially be potted into something so historical. If you think about it some of these pieces have survived so much. I can’t wait to see your collection you bring back and have my opportunity to purchase one or two from you! interesting post yet again. I especially am curious why so many chops would be used to identify a person’s work. Do you have any insight on why potters use different chops on their work? To denote clay is an idea but could it also denote perceived quality? or use? Great post. I did one on Syuzan a while back, he’s also one of my favorites! The pinnacle for Japanese unglazed! 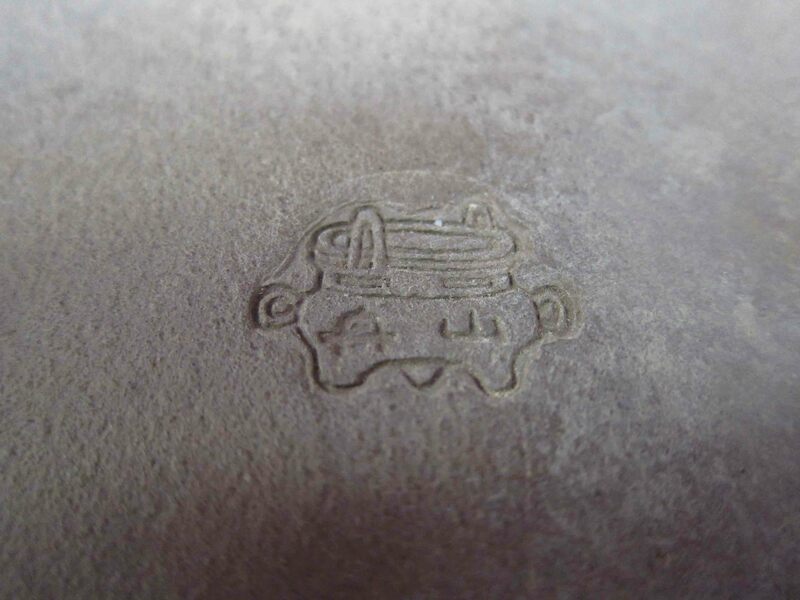 As to the chops, I’m not sure it’s to mark different types of clay, but what info know is this: the teapot stamp is the most valued and fetches the highest prices! !